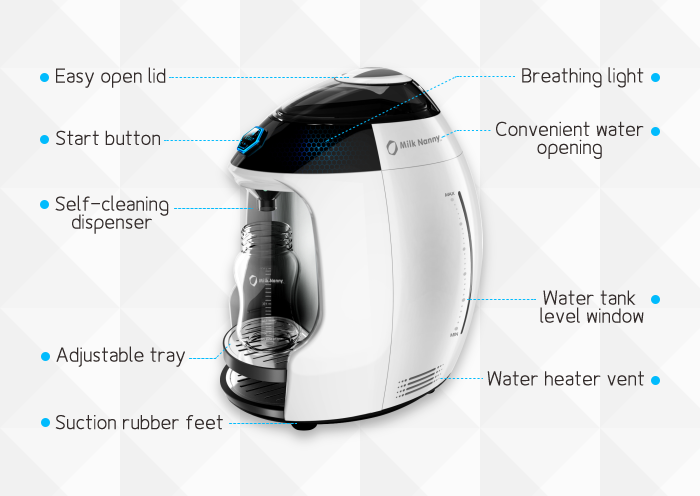 Keurig revolutionized the world of coffee by brewing it just right every time so that busy people could grab their java in a rush, and Milk Nanny is hoping to repeat that revolution for baby milk. Milk Nanny, which is currently in the middle of their Kickstarter campaign, is a foolproof milk-maker. All you do is place the bottle on the machine, scan the barcode on the formula, press the sole big button on the machine or from the app, and seconds later grab your clump-free perfectly warmed milk bottle. If that wasn’t enough, Milk Nanny has disinfecting and self cleaning mechanisms and a lighting system for easy nighttime use. There is also an accompanying app to track feeding and start the machine. The place we see room for improvement is in the marketing. The advertisements for the product only feature women, and they label it as a ‘product for mommy,’ which is absolutely true. We just wish that they also depicted busy, working men who are benefitting from a product like this, too. In fact, the creator said he got the idea when he was making bottles for his son at 3 a.m.
You can pre-order Milk Nanny for $129 from their Kickstarter page. Like this article? Follow this blog and then check out a wearable for your baby. Glad you liked it 🙂 Thanks for checking out the blog and be sure to follow for more interesting posts.